What does it look like for ordinary Christian people to live out their faith in day to day life? It can be challenging to know just what serving God looks like outside of Sunday. Stories of what other Christians are doing can, like a jolt of power to a motor, jumpstart our faith into action. One of the faithful members at Mars Hill embodies the surge of energy that serves as a clear example for us to emulate. A glowing example of what it looks like to share the love of Jesus through his job and leverage it to build the Kingdom of God. 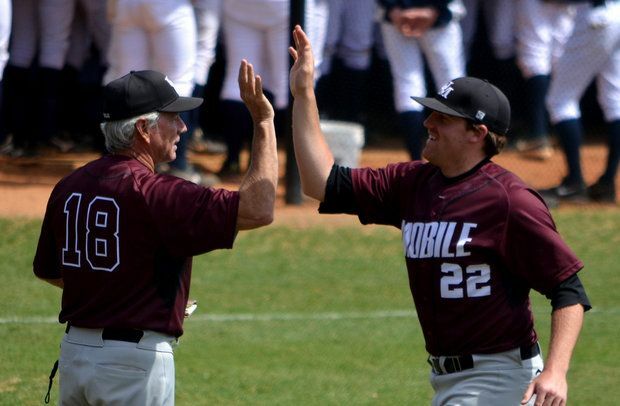 Mike Jacobs is the only head coach that the University of Mobile (UM) baseball team has ever known. The Baseball program began in 1990 with Coach Jacobs at the helm. Birthed from a field of weeds on campus, it has now blossomed into one of the most excellent baseball facilities in the country. He currently sits as the 11th winningest active coach in the entire NAIA. Under his leadership, 37 former players have gone on to play professional baseball, including 2X World Series champion J.C. Romero. The most impressive thing about coach Jacobs, though, is how he cares about each player on an individual basis that passes through the program. As a former player, I can attest that these are the pillars that give firm underpinning for his coaching career. Each recruit signs on knowing that he will hear the gospel of Jesus Christ at the University of Mobile. That may happen at team church attendance, during infield drills, or in the weight room. They will hear that Jesus Christ came to earth to die and rose from the grave so that all who place their faith in him will be given new life for eternity. Coach Jacob's next promise is to do his very best to help them in the classroom as well as on the baseball diamond. At one point in my playing career, our team was playing poorly, and coach Jacobs was understandably frustrated. He tried everything, yet we were still losing games. One day a typical Mobile thunderstorm forced us to meet under the covered cages for batting practice. Coach Jacobs walked down to get started, and I vividly remember him telling us, "I don't know what to do, so I'm going to do the only thing I know to do when I don't know what to do, I'm going to pray." Right then and there coach Jacobs knelt to a knee and prayed. To be completely honest, I have no idea what he even said. Right as he started to pray God opened the floodgates. Maybe it was the Holy Spirit or perhaps it was just some severe rain, but the sound on the tin roof was undoubtedly deafening. I had to keep my eyes open to see when he finished. To us though, it didn't matter what he said. To this day when I face a difficult time in life when I don't know what to do, I remember the words of a wise coach, and I pray. Now, coach Jacobs is not perfect by any means. The first person you could ask about that would be his wife, Mrs. Joy. They have been married for over 40 years. Their lives are continually devoted to serving the UM baseball team together. Honestly, Mrs. Joy is probably the real key to the success of the baseball program. If you have ever gone to a baseball game out at Jacobs Field (yep it is already named after him), you have heard Mrs. Joy cheering from the stands with her signature "Indian yell." There is no mistaking that sound if you have ever heard it before. They even came to our wedding, and she let it rip as if I had just hit a home run. More importantly, though, is the way that Mrs. Joy and coach Jacobs genuinely care for each player of which they get to cheer for and coach. Mrs. Joy is like a second mom for every player, especially the ones whose family can't make it to many games. The team can lose by 15 runs, and she still meets each player at the top of the stairs with a smile and something positive to say. At the annual alumni game, I heard several former players say something along the lines of, "I was a cocky young kid when I stepped onto campus to play baseball, but coach Jacobs helped turn me into a man." Today there are hundreds of men around the world who were positively affected by playing on the University of Mobile baseball team. Even more incredible is the number of young men who have received new life in Jesus Christ because of the prayers and influence of coach Jacobs and Mrs. Joy. Coach Jacobs is not particularly unique or extraordinary in any way. He is merely a man who serves an unimaginably extraordinary God. He makes practice schedules, throws batting practice, and recruits new players to the best of his ability each day. All the while seeking to make the good news of Jesus Christ known whenever possible. He and his wife pray for and trust in, God's power to move in the lives of each student-athlete under their care. Then, they leave the rest to God. God uses baseball coaches and people like you to share his love with the world. The last words of Jesus in (Matthew 28:19-20) compel us to go and make disciples. Let this testimony of coach Jacobs' encourage you to serve God faithfully and humbly right where you are.